As reported in the National Post, Prime Minister Justin Trudeau is under siege over an allegation his office attempted to politically interfere in a criminal corruption case against SNC-Lavalin, a massive Quebec-based engineering firm with a hand in many Canadian infrastructure projects. Trudeau called the allegation “false” on Thursday and in a carefully worded response said he never issued directions on the case. “Neither the current nor the previous attorney general was ever directed by me or by anyone in my office to take a decision in this matter,” Trudeau told reporters. But the opposition accused him of parsing words to avoid answering whether any attempt at influence was made. 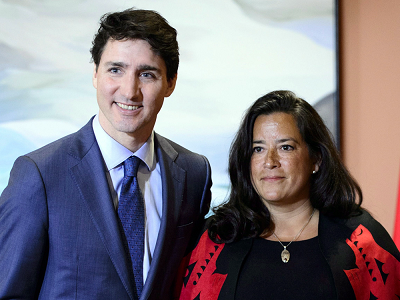 The firestorm was kicked off by a report in The Globe and Mail Thursday that, citing confidential sources, alleged the Prime Minister’s Office leaned on then Attorney General Jody Wilson-Raybould to negotiate what’s known as a remediation agreement with SNC-Lavalin. The company was criminally charged in 2015 with allegedly paying bribes to Libyan public officials between 2001 and 2011 in exchange for construction contracts in that country. The National Post has not independently verified the allegation of political interference.